My account is expired also and the password should not have expired until July 29th. Do you know the best way to contact them? I say 112 million...but I will be very happy if I am wrong and it turns out to be 0. I have always been able to access my Warka account online and today the link I have always used didn't work. Has anyone else had any difficulty.? If not can someone provide me with the correct link. e-bank@warka-bank-iq.com c.accounts@warka-bank-iq.com c.services@warka-bank-iq.com ifrd@warka-bank-iq.com 3313@warka-bank-iq.com sawsan@warka-bank-iq.com I have recently used all these email address for Warka and they worked just fine. I have also received replies. I would send my communication to all and see who responds. I have had a Warka account for some time now and always used the online banking for inter account transfers. Just recently I've gotten a message that my password has expired and to contact my system administrator. I have sent an email to several of the addresses I have on file but so far have not gotten a response. Has anyone else had that happen to them. WAGNERPF replied to Fearless Four's topic in Dinar-ify me! Here is my photo to be verified. Adam I would like your thoughts regarding the negative posts concerning Warka Bank. Do you think that our funds at Warka are at any more risk than when you wrote your book? 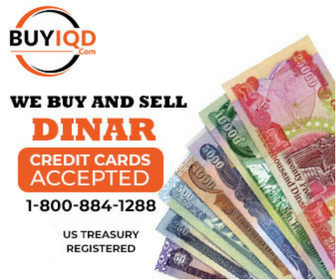 I spoke to 53rd Branch in Clearwater FL and was told that they received an email yesterday instructing them not to sell the Iraqi Dinar's anymore because the purpose to sell them was for travel not for investment purposes. I think this is a good indication. Go RV. Could it be an indication of the coming rv??? I logged on to my Warka account and everything is normal with both the IQD account and the USD account. Must just be something wrong with yours. Thanks for the post. Sorry to hear about the ill intended actions toward you.